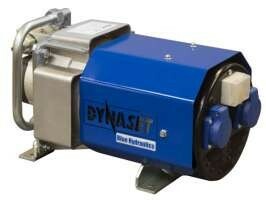 DYNASET HG Hydraulic Generator converts the hydraulic power of a mobile machine into electricity. The world’s best power-to-size ratio guarantees easy installation on mobile machinery such as excavators, trucks, platform lifts, service vehicles. It can be fitted into any mobile hydraulic system and thanks to its compact size and light weight, it is easy to install anywhere on the mobile machine. HG can also be located in confined space since there isn’t any space consuming fuel tank or an exhaust pipe creating air pollution and heat. 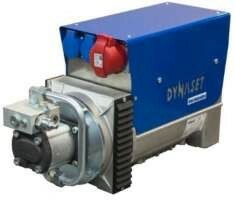 HOW DOES THE DYNASET HG HYDRAULIC GENERATOR WORK? HG Hydraulic Generator produces high quality electricity using the power from the base machine’s hydraulic system. The HG is turned on by opening the hydraulic oil flow to it. Then the hydraulic system feeds the hydraulic oil flow to the HG’s hydraulic motor. 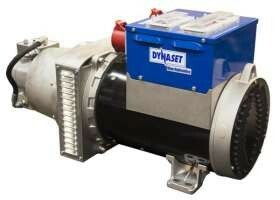 The motor is integrated into the generator and when it starts the generator produces electricity immediately. HG is designed to handle fluctuating hydraulic oil flows to ensure continuous high quality electricity. By installing HG Hydraulic Generator into a mobile machine it increases the vehicles productivity and net worth. 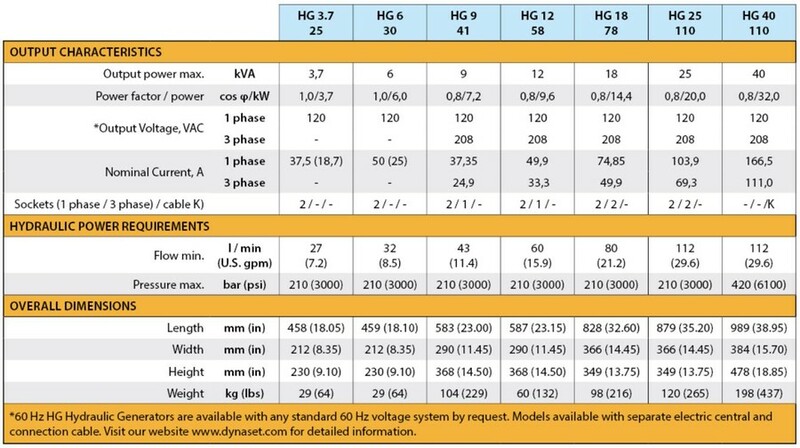 HGs are compact, many times smaller than traditional generators. There is no more need for dragging big separate generators to the work sites, HG is always on aboard and ready for use. By installing the HG to the mobile machine the utilization rate of the machine increases and there is less need for multiple machines on the work site.